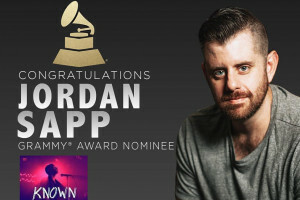 Jordan Sapp ’08, professional music producer and songwriter for Capitol Christian Music Group (CMG) in Nashville, is taking the Christian music industry by storm. His first Dove Award for producing on Tauren Well’s album “Hills and Valleys” (Pop/Contemporary Album of the Year) and his first Grammy nomination for their song “Known” (Best Contemporary Christian Music Performance/Song), are due, in part, to his Malone experience. Sapp took piano lessons as a child, but soon recognized the need for a good musical foundation in order to succeed in his field. While he was a student, Sapp was involved with the chapel band, worship nights, talent shows, and time spent with friends, many of whom he’s still connected with today. He also did an internship with Benjamin Payne at his studio, Studio 521, which provided him hands-on experience with the recording process and real-world outlet to improve his skills. Upon graduation, Sapp and his wife Jessica moved to Los Angeles for his first industry gig: working on Guitar Hero with Activision. A few years later, he was given the opportunity to work under a major music producer as an engineer and vocal producer, which gave him experience bringing the vocals of well-known pop artists to the highest industry standard. After the arrival of children to their family, the Sapps chose to move to Nashville, where he immediately signed a publishing deal with Capitol CMG. Since 2014, he has co-written and produced a few #1’s at Christian radio (Aaron Cole - “Right On Time” and “One More Day”, Blanca - “Real Love”, Tauren Wells - “Known”), as well as his recent award contenders and winners.